Capitalism II Game Review - Download and Play Free Version! Start from the humble beginnings of a Ma & Pop shop and use your business skills to grow to a multinational conglomerate! Game closely resembles actual business - make a profit by buying and selling businesses and products. You have complete control and freedom - choose the products you sell, the ways in which you invest your money, and even your shipping methods. The freedom makes this game have endless outcomes, thus providing you with hours and hours of new gameplay. Multiplayer option allows you to network with friends and create competing businesses. Capitalism II is really dense and difficult to learn, especially if you do not have a strong business background. The financial graphs are difficult for a first-time player to read and understand. All the cities look the same and the industry within those cities is the same. Taipei and Seoul look like Pittsburgh and Chicago, and the products sold in these different cities is the same. Take a small start up company and turn it into an enterprise! Get ready to build a store, manage a product set, manage supply and demand trends, make marketing decisions, figure out delivery and storage of products, there are a nearly infinite number of things you'll have to monitor. Capitalism II is not for the casual simulation game player. This is an extraordinarily hard game to beat! If you are used to simulation games which you can beat in just a few hours, this one you will find to challenge you more than you have been in any simulation before. The learning curve is steep, even with the friendly layout, because of the sheer volume of information which is available. Don't let the daunting interface scare you off though, if you are willing to spend some time learning this game, you will not only have a great time... but even learn a lot in the process. 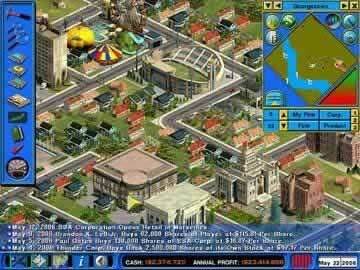 Since Capitalism II is an accurate model of the real world, it will seem complicated, but super enjoyable as you grow to understand more and more. One helpful feature is the Entreprenuer's mode. Essentially this is a tutorial to help you learn how to play and enjoy the game more. This game is hands down the best game to simulate real economics and is even the basis of many college courses. 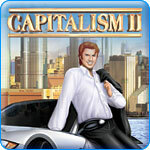 Challenging and rewarding play combined with real world economics make Capitalism II a winner! Like in any business the key to success in Capitalism II is profit. This requires you to buy, sell, invest, and produce in order to make substantial money. Capitalism II isn’t about turning one dollar into two or one thousand into two thousand. You will make billions from a couple million. Capitalism II is big business dealing with big money. This big business element is both a positive and negative part of the game. The game is very realistic and packed with a lot of business strategies and information; however, because of this it is hard learn. This vast sum of information may be difficult for non-business oriented people to understand. As the game begins you are given three options of play. One, which is a plus for any simulation, is the multiplayer mode. This mode allows you to compete and build your enterprise with and against other players via personal networks or over the Internet. The other two options are single player, either entrepreneur or capitalist. The entrepreneur section doubles as a tutorial and in this section you build your business empire from the ground up—starting with your parent's hurting grocery store business. This mode also starts with a tutorial that is much needed as a first time player. The tutorial is extremely helpful, however, even when you’ve completed it, you may still feel confused. There are so many features in this game it is hard to figure all of them out within the 10 minute tutorial. The Capitalist section of the game is much more complex and packed with more features and is for more advanced players. In it you are given a handful of businesses that are already in operation. It is your job to analyze prices, buy and sell properties, trade stock, and invest. As CEO you need to multiply your money 10 fold in order to succeed. Capitalism II’s advantages are also some of its disadvantages. The game’s density and large number of features make this great for a business enthusiast who is highly knowledgeable; however, because of the many features this game is hard to learn. The gameplay overall (button layout, ease of use) is smooth and the graphics are superb, minus a few financial graphs. One other error in aesthetics you may notice is with the differing cities. Seoul, South Korea is identical to Pittsburgh, Pennsylvania. Also, the resources and products produced in these two cities are identical. Now you may never have been to either Seoul or Pittsburgh, but you can guess that the cities differ both geographically and in what they produce. This flaw is minor; so don’t let it ruin your perception of the game. 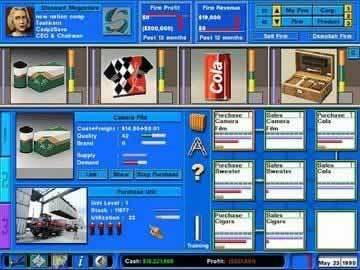 Overall the game is highly recommended for anyone with business knowledge, entrepreneurial interests, or a desire to succeed financially. Its complicated nature makes it a great lifelike game, however, the large number of features may be difficult for non-business people. If you are someone looking for a challenging and realistic simulation this game is for you.